Turkish President Recep Tayyip Erdogan has promptly finished his visit to the US and will skip the final farewell to legendary boxer Muhammad Ali, amid reports that he had been refused permission to deliver a speech at the funeral and had been prevented from undertaking some religious rituals. 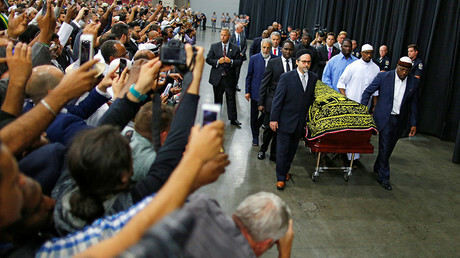 Erdogan attended a Muslim funeral for the boxer on Thursday and was expected to attend the final ceremony on Friday in Louisville, Kentucky, alongside other world leaders. But his office said that he left the US late on Thursday without giving any explanation, according to Reuters. According to CNN Turk, during funeral prayers on Thursday Erdogan was not allowed to lay a piece of cloth from the Kaaba on the coffin while the head of Turkey’s religious affairs directorate did not receive permission to recite from the Koran. To make things worse funeral organizers took Erdogan off the list of possible speakers at the funeral allegedly due to time limitation, a report published by Turkey's Dogan news agency said. “The fact that he converted to Islam at the age of 22 in a country such as the United States and maintained his stance without diverting from the path he knew as right ... attracted our admiration,” Erdogan said, according to Reuters. There were also reports of a quarrel between US secret service officials and Erdogan’s body guards over standing room, Dogan suggested. The speculations have been denied by Erdogan’s office, which explained that the president had “completed his religious service” and decided to take off. Three-time world champion Muhammad Ali, who died at the age of 74 in Phoenix, Arizona, joined the Nation of Islam, the black separatist religious movement, in his 20s, and then converted to Islam.